Despite this Wreck-it Ralph sequel carrying the title Ralph Breaks the Internet, he does no such a thing until the final 20 minutes (the movie title in itself feels like a spoiler), but that’s all fine and dandy considering Disney (directors Rich Moore and Phil Johnston, who last worked on the absolutely brilliant and one of the best movies of 2016, Zootopia, which handled complex themes such as prejudices filtered through a utopia of all animal species) are once again raising the bar for animation in regards to animation, storytelling, humor, and subtext. 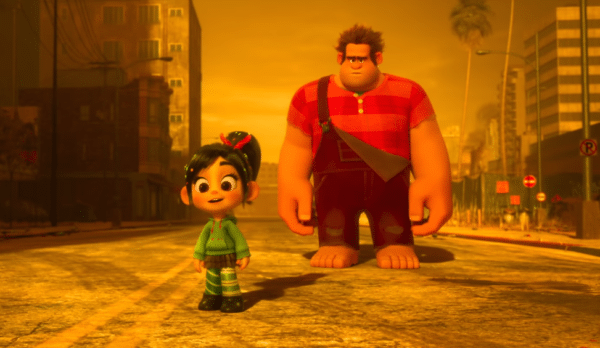 Ralph and Vanellope (the returning and always welcome voices of John C. Reilly and Sarah Silverman) are now the best of friends; when they are not inside their respective games and being played by arcade patrons, they are tethered together at the hip, with Ralph never even thinking of removing his makeshift medallion distinguishing him as her hero. For someone that has gone the majority of his life literally without a single friend. It’s believable and empathetic that Ralph would inevitably cherish their friendship a little too much, developing a clingy attitude. His insecurities are on full display, and Vanellope is also given conflict and doubt when the duo venture off into the Internet and explore a rougher and more destructive racing game (this one is built on the goals of escorting cargo across its various maps) called Slaughter Race, which feels like a cross between the Twisted Metal and Fallout video game franchises. 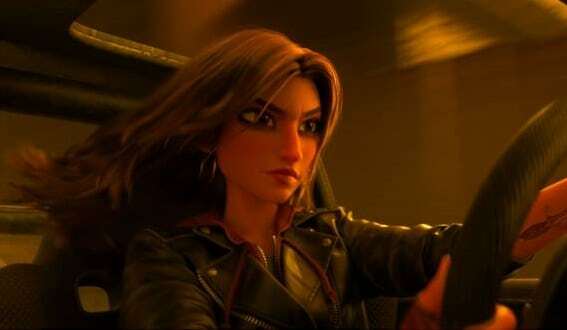 If she were to leave their happy arcade home for a gaming experience that better suits her daredevil personality, with an equally worthy role model in Gal Gadot’s Shank (the hardened, independent, showy but fearlessly talented racecar driver protagonist of the game), how would Ralph take such a scenario? Probably not good, and Vanellope knows this. Aside from insecurities (by the way, which is spelled out as a theme of the film right on screen and made a plot point, presumably not to insult the intelligence of adults but so children can easily soak up the message present), Ralph Breaks the Internet also deals with the anxiety that the friendships we cherish will change in ways we aren’t ready to accept, even if it is for good reason. 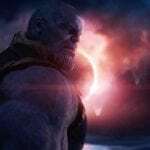 It’s a less subtle theme that I imagine will impact adults far more than kids, who don’t really have to worry about such a thing until roughly high school unless life throws them through a number of unpredictable situations that forces them to adapt. Nevertheless, this is still a charming comedy featuring an assortment of video game cameos (nearly identical to all of the characters present in Wreck-it Ralph) involving terrific jokes pandering to the demographic (there’s a humorous bit centered on whether or not Street Fighter‘s Zangief waxes his chest hair or not) headed up by some more returning original characters (namely Ralph’s former arch nemesis Fix-it Felix and Jane Lynch’s Mass Effect inspired sci-fi soldier Calhoun, now starting a family which wins some nice laughs), but in shifting the focus of the narrative to Vanellope, so do does the setting to the vast digital landscape of the newly installed Internet. The goal is to find a replacement steering wheel for the Sugar Rush arcade game Vanellope resides inside off of eBay, with the pals naturally being oblivious to the many apps and websites that make up the Internet. 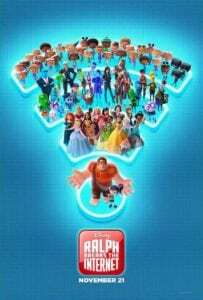 This allows for the first hour (just like its predecessor, Ralph Breaks the Internet borders on two hours, and while it is undeniably paced solidly, one can’t help but feel the length as the film races to the finish line) to indulge in some fantastic fish out of water humor where the two encounter a plethora of supporting characters ranging from Taraji P. Henson as the curator of a viral video hosting website, Alan Tudyk as the sentiment embodiment of a search engine, and Alfred Molina as a ghastly looking towering creature capable of creating program viruses, all alongside passing experiences with the most notable avenues of the Internet. Little do they know that eBay auctions require real-life money to complete the transaction, prompting them to scour the Internet for ways to scrounge up the dough within the allotted 24 hour grace period, eventually getting into the line of stealing high-level equipment from other video games for sale (an option amusingly approached by a shady pop-up ad character) or utilizing the unique and whimsical look of Ralph (alongside John C. Reilly’s distinct voice) to create and promote viral videos. The handling of how these gags generate popularity is nowhere near as believable or seemingly well researched as the filmmakers have done their homework on actual video game knowledge and the expansive world of the Internet, although maybe it is a bit too much to expect an animated film to realistically portray the act of going viral. 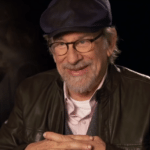 This is also forgivable considering that, for the most part, Ralph Breaks the Internet does a more immersive job and provokes less technical questions of how things work than the first film (yes, I still wonder about how certain interactive aspects function when the characters all have their own free will). Besides, there’s an entire 15-20 minute segment dedicated to Disney.com, loaded with cameos and references that are worth purchasing a ticket for alone. Intriguingly, the Disney princesses also play a pivotal part in shaping Vanellope’s character arc, also while the script puts on blast some of the less unsavory creative decisions about past beloved Disney films. They also play a role in the ending that is simply wonderful and should make women around the world smile wide. 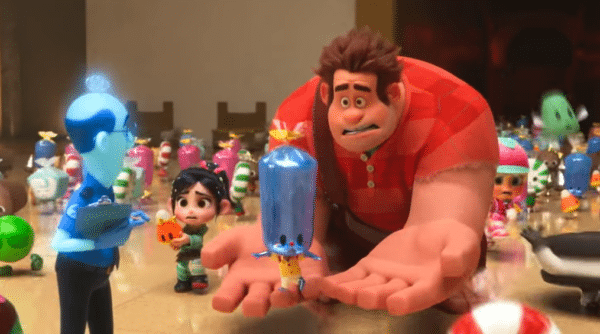 It can drag a little, but Ralph Breaks the Internet is one of the best Disney sequels to date and an imaginative portrayal of the digital world, complete with hilarious cutaways to photorealistic animated human beings freaking out when their Internet connection is lost. 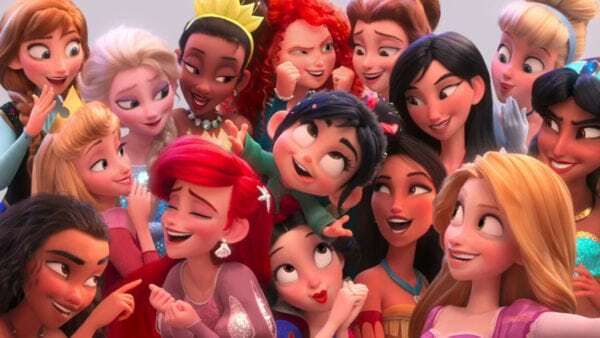 Speaking of that, whether you’re an adult or child, have kids or not, close your Internet browser right now and check out Ralph Breaks the Internet; there are touching themes universal to all ages, love for both its charming protagonists and the Disney brand as a whole, and it continues to turn the traditional vision of a Disney Princess upside down..